Kids learn about rocks and gems...from right up the road. 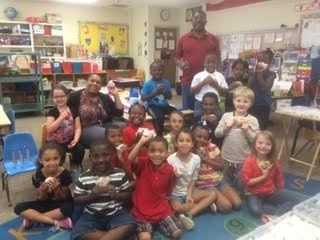 Frank Jones of Duke Energy visited John C. Calhoun to share his collection of gems and stones found at Diamond Hill Mine located in Antreville, SC. Mr. Jones visited students throughout the school where he discussed methods used to dig in the soil at the mine, hundreds of stones, and encouraged students to explore this hidden gem only right up the road.